Elevated between 4206 ft and 6765 ft, the bike trail is among the 5 highest elevated bike Trails in Austria. You're facing an uphill climb of 872 vertical meters on this bike trail. This makes the bike trail one of the 10 bike Trails with the most ascent in Tyrol. You're traveling a distance of 5 miles on this moderate trail. The bike trail is therefore not too long. 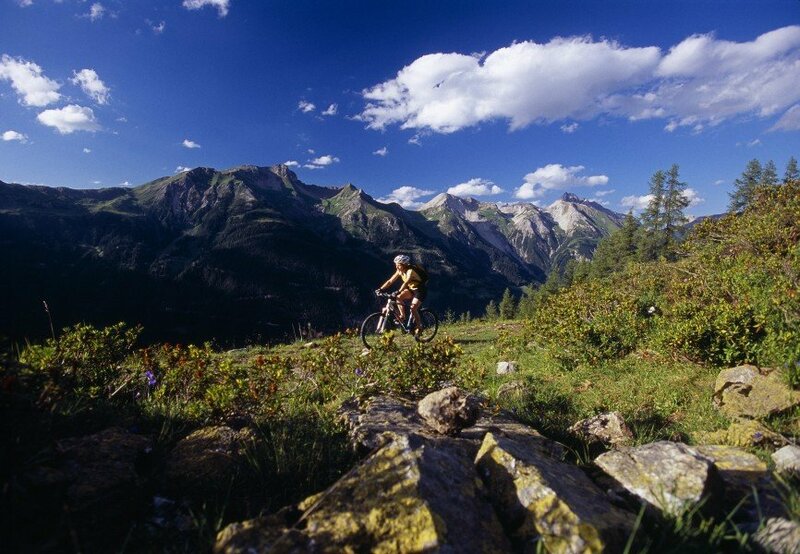 Average length of all bike Trails in Tyrol is 22 miles. At the Kongresszentrum ARLBERG-well.com you'll drive onto the paved road. Driving towards the east, you'll be reaching Nassereinbahn strictly following the old railway line. Once you'll get there, you turn into the Nassereingasse. At the well, you stick to the left and continue on the Nassereinstraße until you get to the chapel, where you'll turn left. You'll be heading towards the Herrenwald on a gravel path until you reach the Schöngrabenbach bridge. Just before the bridge you'll take a sharp left turn in the direction of the Rodelalm. At the junction Rodelhütte (Jausen station) you keep going straight and at the next intersection you'll turn right. And from the following junction on you keep cycling straight onwards until the road ends. From the highest point of the tour you'll get back to the starting point on the same way. The tour offers a fantastic view on the Lechtaler Alps, the Stanzertal and the Verwall mountain range. Travelling from Salzburg or Munich, you'll be reaching St. Anton am Arlberg via the S16 in the direction of Landeck. Take the exit at St. Anton am Arlberg and continue on the B197. Travelling from Stuttgart or Zurich, you'll head towards Feldkirch and Bludenz on the S16. Take the exit at Langen am Arlberg/ Klösterle in the direction of the Arlbergpass (B197). At the roundabout next to the station, you'll continue on the Dorfstraße. Then, at the next roundabout, turn into the Hannes-Schneider-Weg, which will directly lead you to the Kongresszentrum (congress centre). St. Anton is well connected and easily reachable by train, too. As a rail-jet station many important international fast trains will be calling here. The tour starts in the centre of St. Anton am Arlberg at the Kongresszentrum ARLBERG-well.com, Hannes-Schneider-Weg 11.